The executive Governor of Kaduna State, Governor Nasir El Rufai has come up with a claim that the crowd the presidential aspirant of PDP, Atiku Abubakar used were not Nigerians, rather they were from Niger, rented so that they would be much. Speaking yesterday, he said the People's Democratic Party (PDP) has nothing to offer the public and called them a "gang of thieves", claiming they ganged up against the present President of the nation, President Muhammadu Buhari. he further said the people were rented because those in Sokoto state refused to come out for the rally which drove him to taking actions. He then urged the people of Kaduna State to come out when it is time for APC presidential candidate, President Muhammadu Buhari to do his campaign, saying that they should come and support them for the whole world to see them, not Niger People acting like Nigerians (mocking Atiku). 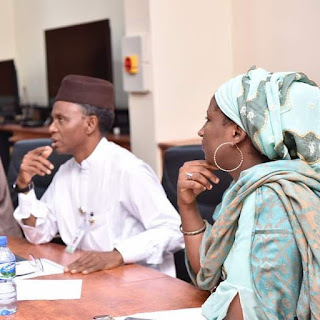 He added that the People's Democatic Party has absolutely nothing to offer Kaduna State people and Nigeria as a whole, he went ahead to list all the bad deeds, saying that they left 4250 primary schools in a terrible condition, not having roofs, windows, doors and so on.